I love … Love... LOVE these cookies! They were traditional for Christmas in my husband’s home growing up. 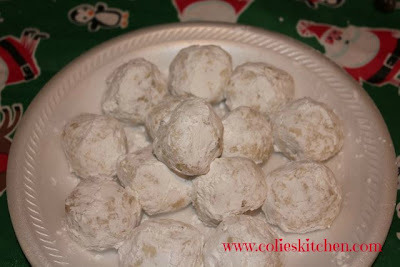 They were also something we always had in my house too but instead of Russian tea cookies we called the Mexican wedding cookies. The recipes are exactly the same! These cookies are great and easy! Wow so easy! I stuck them in the Kitchen Aid mixer and then !BAM! they were done! I rolled them into little balls baked them and sugared them. Just that easy and oh so good!! Cream butter in a large mixing bowl. Add the vanilla then gradually add the 1/2 cup confectioners' sugar, beating until light and fluffy. Sift the flour, measure, then sift again with the salt. Add gradually to the butter mixture. Add the pecans and mix well. Shape the dough into 1-inch balls and place 2 inches apart on un-greased baking sheets. Bake for 20 minutes, or until edges are very lightly browned. Remove the cookies from the baking sheets and roll in powdered sugar while still hot. Cool on wire racks and roll cookies again in powdered sugar before serving.